Cover photo: 150 years ago, on the 4th June 1849, the Manchester, Buxton, Matlock & Midlands Junction Railway opened its only section of line from Ambergate to Rowsley. As the line was projected to pass through Chatsworth Park, the station at Rowsley was built on such an alignment. However, subsequent development led to the opening of a new route through Bakewell in 1862, together with a new sation at Rowsley. The original terminus then became a goods depot. This evocative view of the old station was taken around the turn of the century. It was closed on 1st July 1968 and is now the centre-piece of a recently opened retail park. Rear cover: The proximity of Chatsworth House, and to a lessor extent Haddon Hall, attracted excurtionists to Rowsley from the outset. This handbill of c.1875 illustrates the station’s importance. At that time the term for Matlock referred to the area covered by both Matlock Bath and Matlock Bridge stations, although the former was of far greater importance for excursion traffic. The extent of this traffic can be gauged from the notices for Whit. 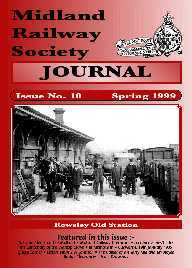 Monday 1914 when 26 additional trains called at both Rowsley and the Matlock stations. The war brought an abrupt end to this tradition and it was another 6 years before excursion trains were re-introduced, and then only in a limited form. The development of the internal combustion engine, however, prevented a return to the pre-war levels of patronage. Nevertheless, Rowsley remained an important destination for Bank Holiday excursionists until 1966. 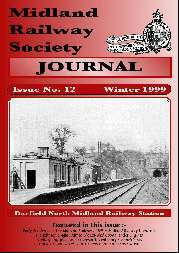 Cover photo: The North Midland Railway station at Darfield was another one with staggered platforms [Jnl.11, p.18]. This interesting view of the Up platform probably dates from the last decade of the 19th century as the 154 yard Cat Hill Tunnel in the background was removed in the course of widening the line in 1899 / 1900. Darfield station itself was re-sited 45 chains to the north as a result of this work. The new station on the Doncaster Road was opened at 12 noon on Sunday 30th June 1900. Rear cover: On the night of 23rd December 1893, a serious land slip occurred in Marple cutting. Single line working was introduced over the Down line between Strines and Marple South, a distance of just over 2 miles. This was on the Midland’s main route from Manchester to London. The “Disley cut-off” was not opened until 1902 and trains attached and detached portions at the cramped Marple station. Efforts were made quickly to minimise the inevitable delays being caused by the slip. This notice, which was issued on Christmas Day, shows that the section of single line operation was to be shortened by opening a new signalbox in Marple cutting and continuously manning the “special occasions only” box at the Goyt Viaduct. The new Marple Cutting box was opened around 29th December. Double line working was restored on 7th January 1894, but the repairs were nowhere near complete. It was June 1894 before the Engineer was able to slew the lines into their permanent positions and 22nd July before the temporary Marple Cutting box could be closed. 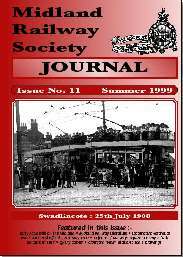 Note the heading “Sheffield & Midland Joint Railway”. Was this the normal form used on operating notices at that time?